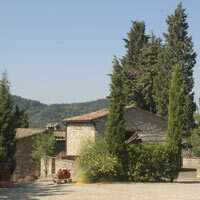 An old farmhouse dating back to 1500, in the heart of Chianti Classico, 450 metres above sea level. Overlooking the beautiful chiantigiano landscape with its million shades of green. Vines, olive groves and oak and chestnut woods surround Ensoli. This is the ideal place for those wishing to recharge their batteries immersed in the peace and tranquillity of unspoilt nature. Situated just 12 Km from Radda in Chianti and 10 Km from Gaiole in Chianti it is the ideal starting point for discovering the enchanting Tuscan countryside and for visiting the famous cities of art such as Siena (30Km), Florence (50Km) and Arezzo (40Km).